James Rodríguez scores two of the goals of the tournament as Colombia walks through a victory everyone can be happy with. 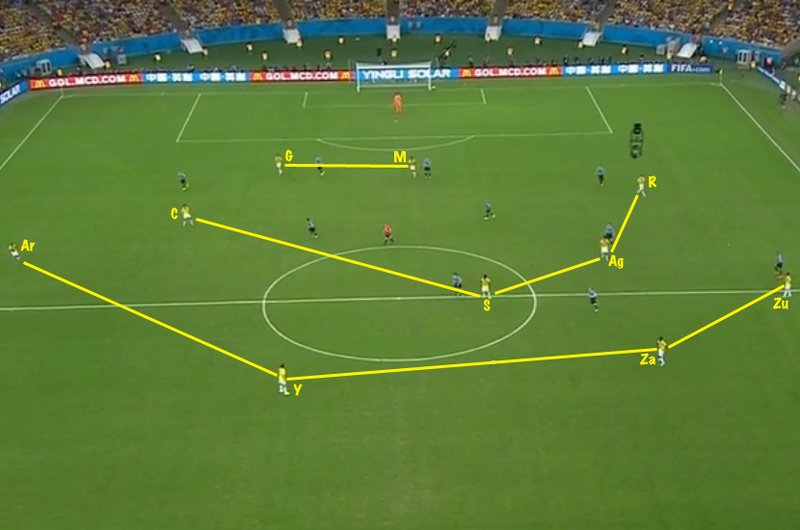 Other than Colombia’s two fantastic goals, formations were actually one of the more interesting elements of the game. Uruguay set out in a 3-5-2, as they had against Italy. Diego Forlán replaced the banned Luis Suárez and Maxi Pereira came in at right wing-back, Álvaro González moving inside for the substituted Nicolás Lodeiro. As had been the case with Suárez, Cavani and Forlán exchanged the role of dropping off into the midfield, though Forlán did so more frequently. The other notable aspect of this shape was the high positioning of Cristian Rodríguez, which sometimes made it seem more like a 3-4-3. Chasing the game in the second half, manager Óscar Tábarez shifted to a 4-3-1-2, replacing a tiring (or at any rate elderly) Diego Forlán with Christhian Stuani and introducing Southampton’s Gastón Ramírez to play behind the strikers. With Álvaro Pereira coming off, Cáceres now operated on the left flank, and Cristian Rodríguez dropped back into a more conventional role within a midfield three (or diamond, depending on how you want to describe Ramírez’s role behind the strikers). Just under 15′ later, Uruguay shifted to a 4-3-3, with Abel Fernández replacing Álvaro González and joining the attack on the left, through frequently interchanging with Cavani in the middle. 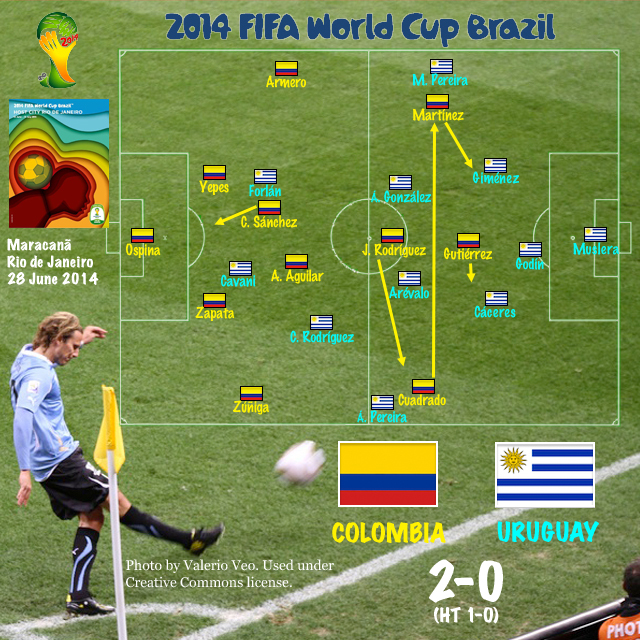 This formation, combined with Colombia’s more defensive posture, allowed for Maxi Pereira’s 74′ breakaway into the box and Cavani’s 84′ chance. 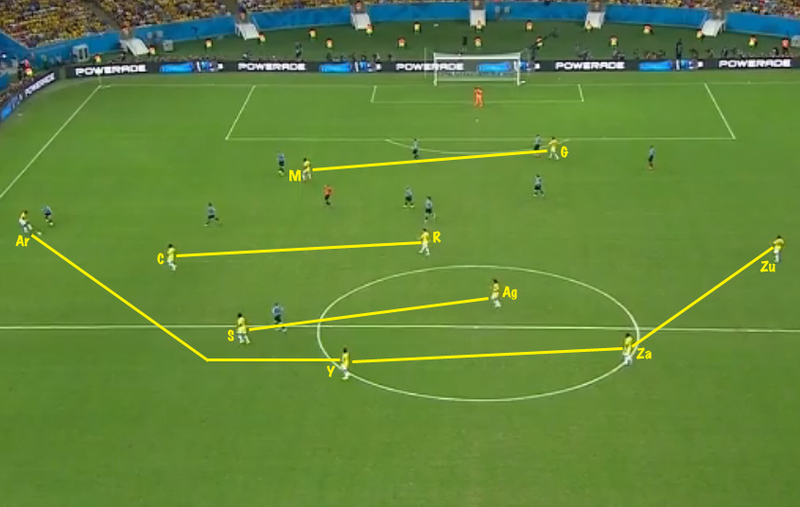 Colombia’s formation was dangerously flexible in attack, and is worth following over the course of the first half. 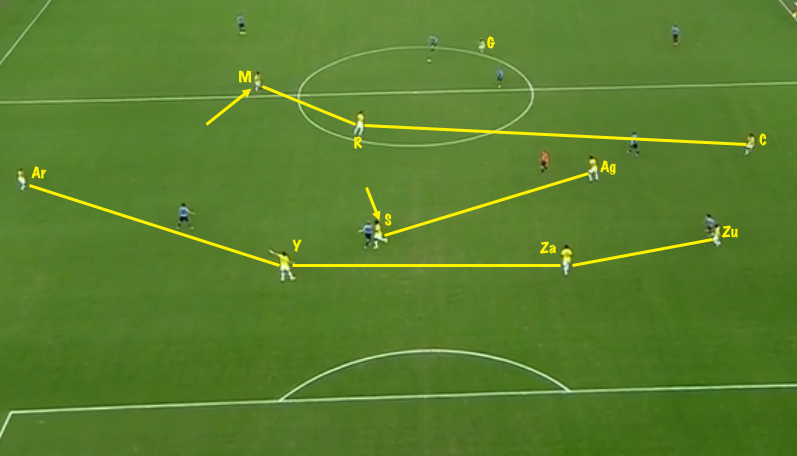 American outlets, at least, suggested before the game that Colombia would employ a 4-4-2 with star James Rodríguez stationed out left, and while something like that did eventually prove to be the case, José Pékerman’s side opened the game in a 4-2-3-1, as can be seen in this 2′ view of a Uruguayan goal kick. Rodríguez is in his favored interior position, with striker Jackson Martínez clearly out left rather than partnering Teófilo Gutiérrez up top. This shot was chosen for its clarity, but in the run of play, obviously, things are always more complicated. The following 18′ image, taken right before a dangerous Edinson Cavani run onto a long ball delivered to Colombia’s right goal post (you can see Cavani, just inside of Juan Zúñiga, beginning to make his move), shows two of the ongoing stresses on this shape. The first is Martínez’s natural instinct to move forward into attack; the second is Carlos Sánchez’s marking responsibilities on Forlán, which very frequently pulled him into line with his central defenders. The combination of Martínez pushing up and in with Sánchez being drawn down and in created an ocean of space on Colombia’s left flank. At 20′, Colombia sought to rectify this situation by 1) shifting into a 4-4-2 to allow Martínez to drop off from an attacking position rather than abandoning a flank, and 2) moving Juan Cuadrado from his natural right wing position to the left, Rodríguez compensating by moving out right. This made for a more balanced defensive shape while still allowing for creativity going forward (note that Martínez and Gutiérrez have swapped sides in this shot). The thing about this 4-4-2, however, is that James Rodríguez is never going to just stay out near the touchline–nor should he. And with Rodríguez moving inside, the result is a much narrower formation, especially with Cuadrado operating as an inverted winger and thus also more inclined to cut inside. The result is a 4-2-2-2, with width in attack provided mostly by the full-backs, as can be seen in this 40′ shot. Colombia remained in this 4-2-2-2 formation in the second half despite Cuadrado returning to the right and Rodríguez moving left. With the 68′ introduction of Alexander Mejia for Gutiérrez, Colombia returned to a defensive 4-3-3/4-5-1, Mejia setting up alongside Carlos Sánchez right in front of the back four and Abel Aguilar slightly ahead of them. In this manner, Colombia saw out the game. James Rodríguez (Col) – No one has owned this World Cup quite as fully as James Rodríguez, filling up the Radamel Falcao-shaped hole in Colombia’s attack with his commanding midfield performance. His two goals against Uruguay gave Rodríguez the lead in the race for the Golden Boot, but it’s his all-around play that has most impressed. If Brazil-Chile was the most anticipated match of the Round of Sixteen, Brazil-Colombia could well be the game of the quarterfinals. Luis Suárez (Urg) – In contrast, Uruguay’s most significant player was the one that didn’t play. Admittedly, Uruguay have had less time to adjust to life without Suárez than has Colombia with Falcao, but Suárez’s absence was most visible part of their game in the match. Considered one of the world’s top strikers when at Napoli, Cavani no longer looks quite the part, as this game demonstrated. In the late stages he was dangerous enough, but neither he nor anyone else could replace Suárez’s invention. It’s difficult to imagine that anyone outside of Montevideo will be sad to see Uruguay depart.